"It isn't easy being the rather overlooked and unhappy youngest sibling to sisters named for the other six days of the week. Sunday’s only comfort is writing stories, although what she writes has a terrible tendency to come true. When Sunday meets an enchanted frog who asks about her stories, the two become friends. Soon that friendship deepens into something magical. One night Sunday kisses her frog goodbye and leaves, not realizing that her love has transformed him back into Rumbold, the crown prince of Arilland—and a man Sunday’s family despises. The prince returns to his castle, intent on making Sunday fall in love with him as the man he is, not the frog he was. But Sunday is not so easy to woo. How can she feel such a strange, strong attraction for this prince she barely knows? And what twisted secrets lie hidden in his past—and hers?" 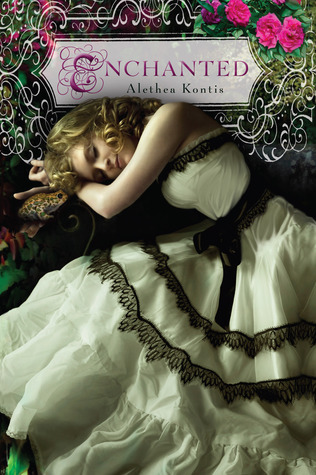 I have been wanting to read Enchanted since I first stumbled across it. Alethea Kontis has a fun YouTube channel where she rants on fairytales (often little-known ones) and I was a part of the Hero Book Tour. And then Amber gave Enchanted to me for the Christmas in July book swap. So at last I was able to read it! This one is a very fun, lighthearted romp through many, many fairytales. It's not exactly a retelling, more of a mash-up, but in true fairytale style. So there's instalove, and plenty of magic, and just go with it. The story is a sweet romance, as well as an introduction to the Woodcutter family and their fairytale world. I was tickled pink by the multitude of (mostly subtle) references to a variety of fairytales, including some lesser-known variants. Kontis weaves them into the story, so they feel like a natural extension of it. And they are by far the most clever and unique part of the story. Which is not to say the book is bad, just known. I recommend this one for fans of fairytales in general, sweet and quick romantic reads, and fictional worlds that have plenty of interesting characters (whose stories are waiting to be told). Personally, I want to read more about Thursday and Saturday now.